As management accounts go, the accounts published by NAMA on Wednesday for the three months ending 31st March, 2012 are pretty dire. The accounts reveal major variances with the budgeted costs for 2012 – legal fees and the cost of receivers in particular – and no explanation is given for the variance. And whilst NAMA has published budgeted costs, it doesn’t publish budgeted revenues, so we have no way of knowing if revenues are on plan. Maybe NAMA would say that publishing its budget for revenues would – yaawwwn! – undermine its commercial performance, but it is already on record for its disposal strategies in different geographical/property markets, so why the secrecy? It has become nigh impossible to see where NAMA is holding all of its “unrealised profit” – €2bn if you believe the NAMA CEO in an interview during the week. NAMA did generate €1.1bn in cash during the quarter, so it is quite feasible that there are “unrealised profits” but I can’t see them in NAMA’s balance sheet. Here’s the overview of the profit and loss of the main NAMA entity, National Asset Management Limited (the 2011 figures are those contained in the four sets of quarterly management accounts – the final accounts for year end were different with the main differences being a €1.3bn impairment, €0.6bn for asset sales and a €0.2bn tax credit). (1) Interest income of €313m for the quarter is down on the €365m in the fourth quarter of 2011. NAMA has been “selling” loans, eg David Daly refinanced nearly €500m of his loans in late 2011 apparently. So these reductions will affect NAMA’s income. On the other hand, non-performing loans have risen again (see below). About 80% of NAMA’s interest is received in cash apparently. (2) Interest expense of €115m for the quarter is down from the €129m in the four quarter of 2011. The 6-month Euribor rate which NAMA must pay on its bonds is reset twice a year, in February and August and NAMA will have benefited from a decline last year. (3) Profit on loan sales of €12m is measly and down from the €174m in the fourth quarter of 2011. NAMA is claiming that it is building up “unrealised gains” from loan sales, but it is unclear from the accounts what these might have been during the quarter. (4) Legal fees. 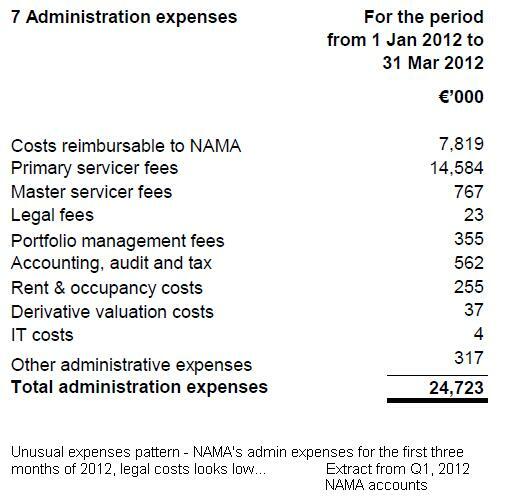 NAMA has a budget of €25m for legal fees in 2012. For the full year 2011, it spent €9.4m. And for the three months ending 31st March 2012, it spent a measly €23,000. That’s about 46 hours of a Dublin solicitor’s time. What on earth is happening??? (5) Portfolio management fees of €355,000 during the quarter look suspiciously low. Remember portfolio management fees are mostly payments to receivers and NAMA has a budget of €33m for these in 2012. (6) “Other administrative expenses” of €317,000 have been booked during the quarter, but this is the first time this heading has been shown and there is no indication as to what is booked under this heading. (7) Cash received of €1.1bn during the quarter is astonishing and even after paying interest on NAMA bonds of €253m and making additional advances of €56m to borrowers and paying €51m to “suppliers of services”, NAMA generated a net €758m in cash during the quarter. (8) Performing loans are now down to 19% from 20% in Q4, 2011. It was recently revealed that the 20% in Q4, 2011 included restructured loans, and that by reference to original loan agreements and values, that just 18% of loans were performing. Because NAMA has been doing more and more restructuring, you might expect there to be perhaps just 15% of its loans that are now performing according to the original loan agreement. That means that NAMA is earning cash interest of about 3% on 15% of €74bn or about €300m per annum. In other words, once these low-hanging fruit are sold and once NAMA has redeemed another €4bn of its bonds as it is now required to do by the end of 2013, the Agency faces challenges in generating enough cash to cover its own costs of €200m per annum and the interest on its bonds of about €300-500m per annum. (9) Overall profit of €133m was booked in the first quarter but this is before impairments. NAMA has said that in 2012, it will be calculating impairments twice a year instead of formerly once at year end. But with Irish property still declining in value, there is likely to have been an impairment charge in Q1,2012 which may well have wiped out any profit but we won’t get further information on impairments until the Q2 accounts are published. 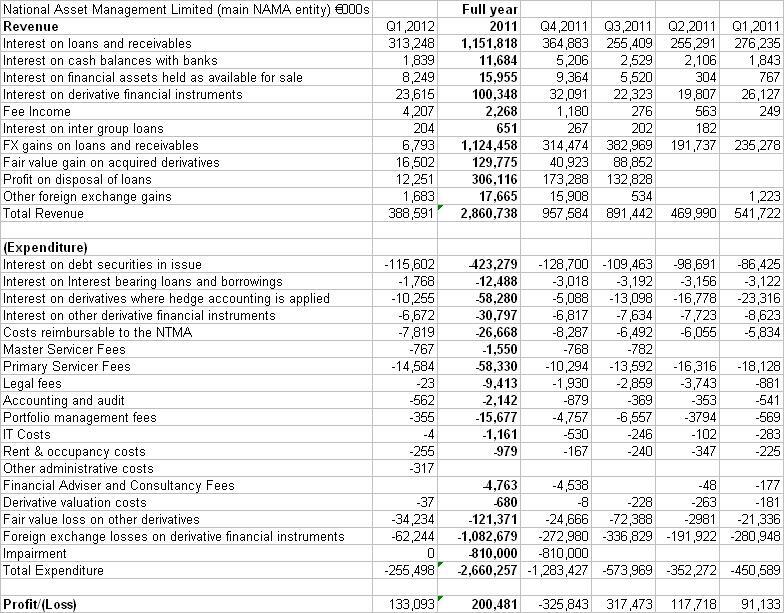 (10) Overall cash at NAMA was €4.5bn at the end of March 2012 which continues to be healthy. Since the end of March, NAMA loaned €3.1bn to IBRC which it has now received back, and it has now redeemed a further €2bn of its bonds, so the Agency continues to sit on a healthy cash mountain, but remember that NAMA has disposed fo 25% of its assets and redeemed just 10% of its bonds, so obviously it should be healthy, but as NAMA redeems more its bonds, the cash position will become far tighter.